Last week, when Mark Zuckerberg met representatives of the emerging tech sector in Nigeria, he shied away from older statesmen and focused on the country’s young entrepreneurs, particularly in Lagos. As well as a new generation of coders and app-builders, this coastal mega-city is home to a growing group of musicians, fashion designers, photographers and architects. In March, I joined a number of people from Britain and Nigeria working in technology and creative sectors, to take part in Playable City Lagos: a 10-day residency run by Watershed and supported by the British Council, to develop playful interventions in urban life. I wrote about their activities for a report out this week from Nesta (publisher of The Long + Short). Tosin Oshinowo, an architect running her own practice, cmDesign Atelier, in Lagos, was one of the participants at the workshop. I caught up with her recently to find out more about the creative scene there. Who are you excited by on the creative scene in Lagos at the moment? There is a guy I met recently. He's called CDQ. He's a Yoruba rapper. [Yoruba is one of three tribal heritages in Nigeria, along with Hausa and Igbo.] You know how you have Grime – his music is similar to that style, but he is very proud to rap in Yoruba. He's very much about pushing local content and language. He has become a good friend, and he tells me how important it is to celebrate and express your own culture. He has become quite popular on the continent. Because of the language, people may not know what he's saying. But because the beat's good, people get into it. We are beginning to see a lot more of that. There are a lot of people pushing local culture. And it's being absorbed – it's being appreciated – not because they understand it, but because it's cool. What helps a lot of the creativity coming out of Nigeria is a very large diaspora. So, say Wizkid [a Nigerian musician whose music is remixed by western artists] is playing in London, all the Nigerian kids might bring along their Ghanaian friends and things spread like that. Also, we cannot underestimate how the spread of information via the internet is pushing our local creative economy. When you live away from home, you have this very strong tie-back. There is Jason Njoku, who started IROKOtv [an on-demand streaming site for Nigerian film]. He is of Nigerian descent and went to the University of Manchester. He was inspired to start the company when he found it difficult to buy Nollywood movies online for his mother. He set up an online platform showing local Nigerian movies after buying direct rights from the Nollywood producers. His company has done very well in a short period of time, has had successful international investment and is one of west Africa's most successful internet companies; all from tapping into the diaspora, helping them tie in with local culture. If it wasn't quality, people wouldn't associate with it. I remember before I left Nigeria, you wouldn't even tell your friend you were watching a Nigerian movie. Now, the quality is so good – people are proud. There has been a massive growth in photography and in the fashion industry. There's Maki Oh [a champion of Adire, the traditional Yoruba art of dyeing cloth with natural indigo], who has dressed Michelle Obama and now Lupita Nyong'o. What about the next generation – those leaving school, or in their 20s. You run talks with local architecture students. What are these like? We take young professionals back into the classroom to talk to the students about their work and experience. And I like to emphasise the word 'young' because this is Nigeria and people like to think that people can't possibly know what they are talking about below a certain age. It's one of the biggest problems we have. The students pick the topics. So we've had a theme about people who are focused on social economic projects. We've had people who've left architecture and gone on to do other things. 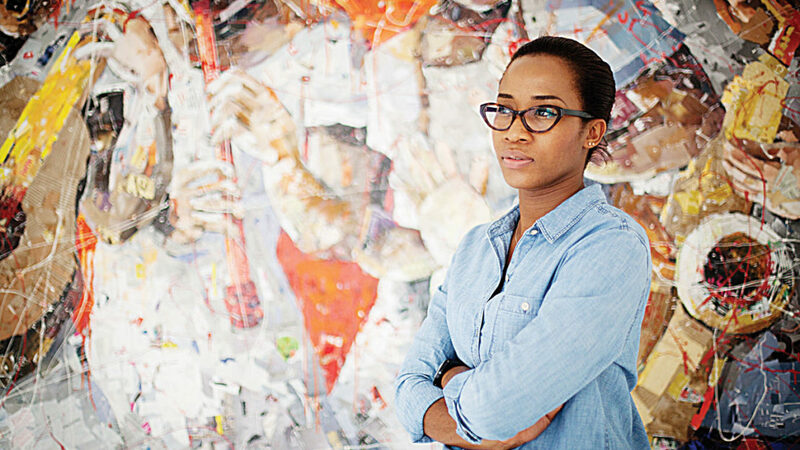 We had Peju Alatise, who studied and practised as an architect but is now a brilliant artist who has exhibited internationally. So the students get to see how an architecture degree is also an amazing platform to step on to other things. You have to be conscious – you don't want to be a big fish in a small pond. I actually recently formed a group with two other architects. It's called African Alliance for New Design (AAND). It was born out of a genuine frustration with our senior colleagues. Particularly the established practices – they get the biggest commissions but they are not pushing design. They fulfil standard requirements but they are not pushing the profession forward creatively. We had an exhibition in April. And it was about showcasing projects produced by our independent practices celebrating design in architecture. But it shouldn't just be about Nigeria or architecture. We have ambitions to create a more formal structure – talking about all kinds of design for the whole continent by creating a platform for dialogue and collaboration. But even as a network, I have to say it's been really useful. We have a WhatsApp group: someone sends a link and we'll all discuss it; or someone wants to know where to get a certain material and we can help them out. It's important to have that level of support. It is about creating a pyramid of knowledge. If someone does something, then someone else might get the confidence to do it and improve upon it. Yeah – I think you are more conscious of being a minority, whereas in London there is so much creativity that you blink and there is another event to go to. But here, when something comes on everyone gets so excited. You get all the creatives going. It's like an identity thing – I don't know how to describe it – it's refreshing, perhaps? It's refreshing in the sense that it's so new.